A few days ago I uttered something to Tammy that I know she never thought she’d hear me say. Me: I’m nervous about going shopping. Me: Because of this whole couponing thing. I don’t know if I’ve done it right so I’m nervous about doing it. I had spent plenty of time clipping coupons and looking through the flyers to see what was on sale. I even found a spreadsheet to help me figure out how much I would be saving. 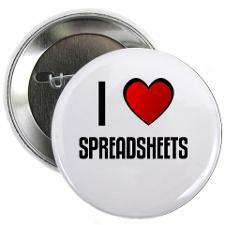 Actually I found several spreadsheets because I’m a spreadsheet nerd. I was so excited about finding them and tried to share my feelings with Tammy, but she wasn’t nearly as thrilled as me. Me: Check out these sweet spreadsheets on coupons. Tammy: Do I have too? Me: I know I’m such a dork, right? Tammy: You don’t have to tell me. I didn’t let her negativity get me down and continued working on putting the right coupons with the right items at the right stores. I even had figured out how the Register Rewards worked at Walgreens and had it broken down to how much I would have spent ($29.26), what my coupon total would have been ($8.00) and what my Register Rewards total would have been ($12.00). I had my list put together but couldn’t pull the trigger. I had stage fright. But Did We Need That? I couldn’t wrap my head around the fact that I was buying stuff we didn’t need. Sure, we would have used the new Dial Speed Foam and two cans of Scrubbing Bubbles. And I’m sure Tammy would have enjoyed the Hydro Silk Razor I would have gotten. But we didn’t NEED those items and all I could think about was that I was spending money on stuff that we wouldn’t be using, at least not right away. The sound of Tammy’s voice asking me if we needed the items kept echoing in my head. I know that it is part of the Couponing Creed to NOT buy things you need and buy stuff that’s on sale but I just couldn’t make myself do it. I’m used to going shopping for cookies when we’re out of cookies. Not buying cookies just because we’ve got coupons when we’ve already got plenty in the pantry. I ended up not going to Walgreens and decided to wait. Cluttered Desk = Cluttered Mind? The next Sunday I got an extra edition of the paper so I would have two sets of all the coupons. Since I was amassing quite a coupon collection I decided I needed to do some organizing. I moved everything to a table in the basement so I could spread out and so we could still use the kitchen table. 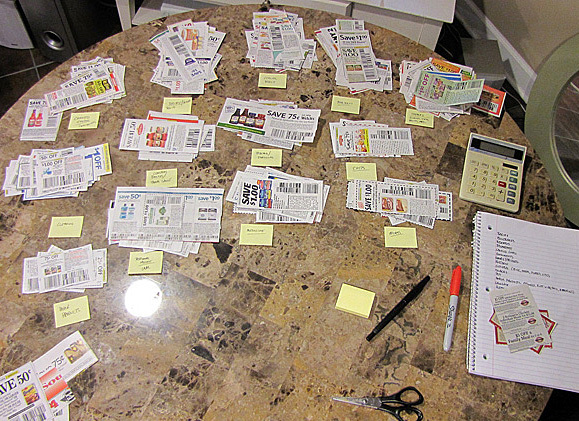 I sorted all of my coupons into stacks and felt like I was well on my way to making my first couponing excursion. But I ended up not going and decided to wait. The next Sunday rolled around and I had Tammy get the coupons out of her Mom’s recycling instead of buying two papers. Tammy and I went for a walk when I saw someone’s recycling bin by the road. When we passed it I saw the Sunday paper on top and told Tammy I was going to look through it when we came back around. I don’t think she thought I was actually going to do it and I thought she was going to die of embarrassment when I actually started doing it. You would have thought I pulled down my pants and took a dump on the side of the road as car zipped by. Unfortunately I didn’t find any coupons. But Tuesday morning I did something I’m not too proud of. I went through my neighbors recycling to see if there were any coupons. I waited until she wasn’t home and made sure there weren’t any cars or people on the street when made my move. Even though Tammy wasn’t around, I still embarrassed her. 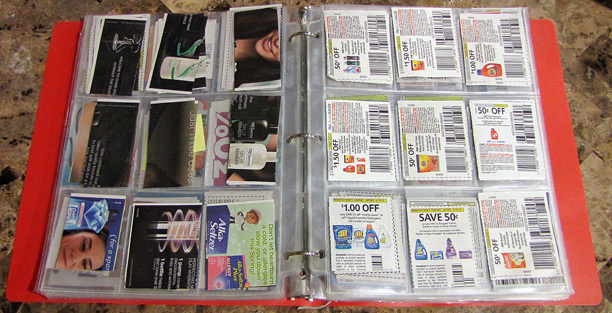 Since my ever growing coupon collection would no longer fit into the accordion-like holder, I started organizing them into clear baseball card holders that I could put into a binder. My confidence grew as I continued to organize, compare and plan. All of the hours spent clipping and sorting were soon going to pay off. Today, March 21, 2012, will mark my first attempt at being a Master Couponer. I’ll write an update once I haul in my bounty of goodness. Gallery | This entry was posted in Daily Life and tagged couponing, daily life, extreme couponing, humor, shopping. Bookmark the permalink. lots of time on your hands there buddy – Good luck today! I’m worried about you. I am going to send Wonderbutt over to eat your coupons. Get thee to a store! Those coupons are tied to sales. Go shopping and do it. You don’t have to do it all at once. Start small. Just get what you need first or what you use often, what you’ll use in the next couple of weeks. You can do it. I still cannot get past buying things I don’t actually need. I would actually be less embarrassed dumpster diving for coupons than purchasing 8 anti perspirants. Passers by would assume I was looking for something in the dumpster but fellow shoppers will think I am horribly sweaty.